The Volume Purchase Program allows businesses to purchase apps and books in volume and distribute them to their users. * You can learn more about the program here. 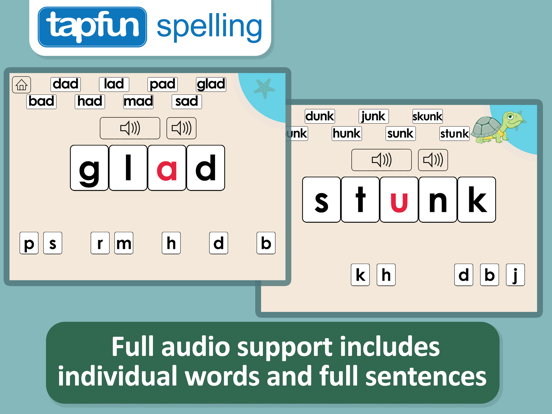 Making Words Kindergarten and First Grade - School Edition by Tapfun Inc. Redeemable Codes: Download a spreadsheet containing redeemable codes which you can then provide to your users. Ownership of the app or book is given to the Apple ID that redeems the code. Codes will only be redeemable in the U.S. store. Managed Distribution: Assign apps to users or devices using a Mobile Device Management (MDM) solution, such as the latest version of Apple Profile Manager. You retain ownership of apps only, allowing you to revoke and reassign them as needed. To assign apps or books to users, users must be on devices with iOS 7 or later or OS X 10.9 or later installed. To assign apps to devices, devices must have iOS 9 or later or OS X 10.11 or later installed. 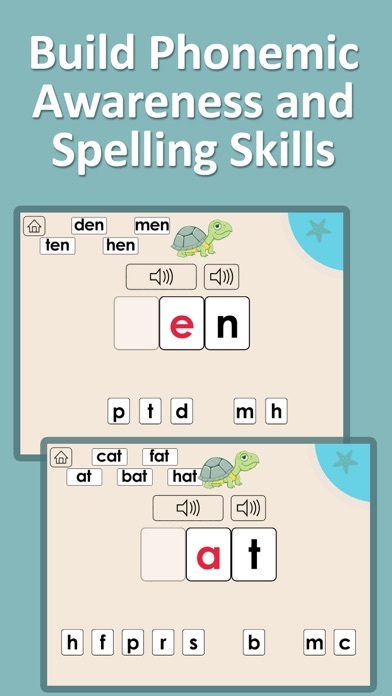 This app includes 50 lessons designed for students to build spelling skills and develop phonemic awareness. The format and word sequencing were developed by Patricia Cunningham and have been recognized for their ability to motivate students in a fun and engaging way. The audio narration was performed by Adam Ghassemi, a professional voice over artist with 10+ years of experience. While developing this application we received feedback from several expert educators and followed their input on how best to present this activity to students. 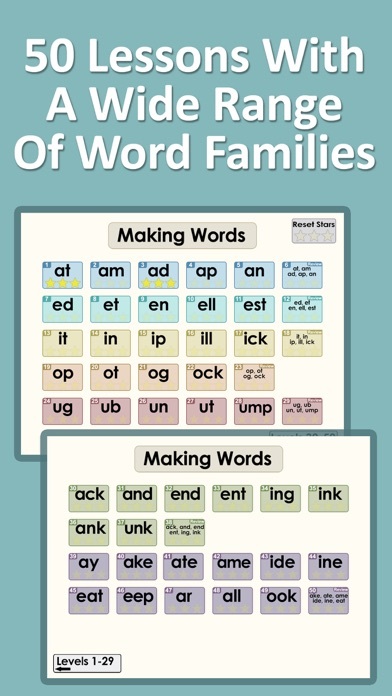 The app is designed to be used independently but can also work well where a teacher or family member is available to work through word families with the student(s). 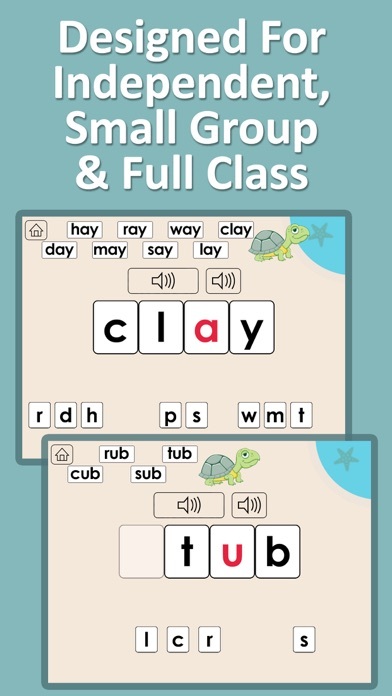 Speech language pathologists and special education teachers will appreciate the highly structured sequencing present in this app. 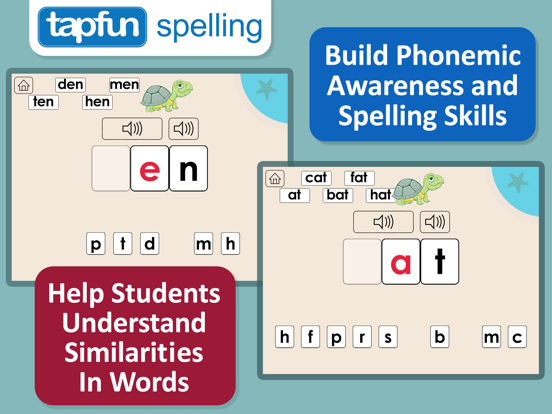 1) Features 50 fun and interactive lessons for building phonemic awareness, phonics, and spelling skills with your students. 2) Presents a concise method for involving students in the process of identifying phonological units and patterns within words. 3) Promotes student awareness of similarities in words that helps develop writing skills. Each lesson focuses on a primary letter pattern and includes a number of words in that pattern that the students spell. The first lesson is the 'at' word family. 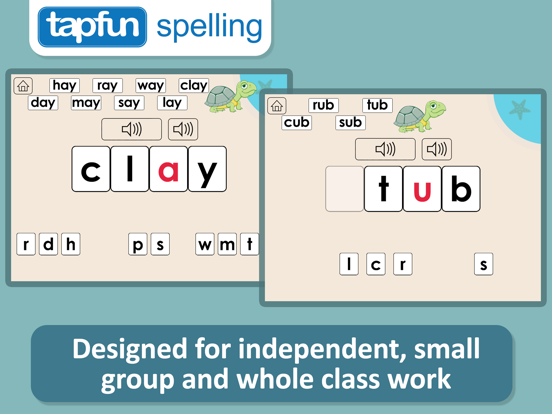 Students must place the letters in the letter spaces by dragging the letters from the bottom. The app will automatically determine if the word is correct when all of the letter spaces have been filled. Students are encouraged to use the audio support to hear clear instructions. 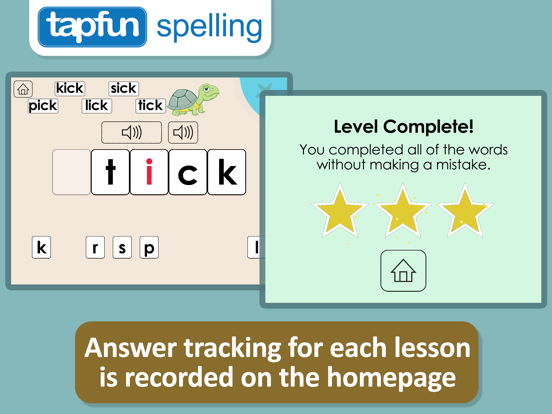 Once the students have spelled the target word, the app will prompt them to spell the next word in the sequence. The app automatically tracks how many errors the students are making during each lesson. If zero mistakes have been made, the students receive three stars which are shown on the home screen. If less than three mistakes are made, the students receive two stars. If three or more mistakes are made the students receive one star. By tracking the number of errors, teachers and parents can easily see how well their students are doing and which lessons they have completed on the home screen. To reset all stars to zero, simple press the 'Reset Stars' button. Making Words has been recognized as a great activity because it helps students understand similarities in words. 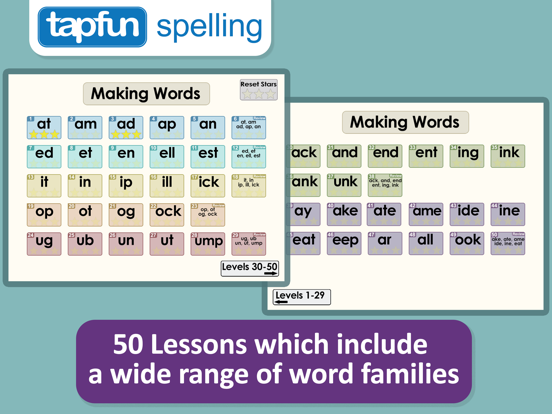 Further, it presents an effective structure for strengthening spelling and phonics skills. 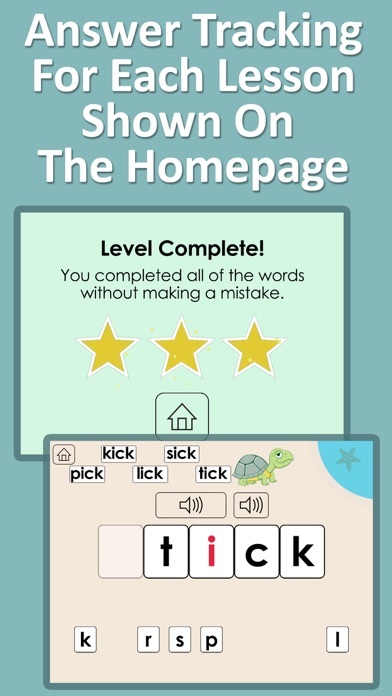 By keeping each lesson to one word family the app develops students understanding of letter patterns. A review level is presented after each set of word families that correlate. For example, after the at, am, ad, ap, and an families, there is a review lesson. Patricia Cunningham developed the Making Words activity while working with Title I teachers in North Carolina. In 1991 she wrote "Phonics They Use: Words for Reading and Writing" which is currently available in its fourth edition. According to Allyn and Bacon, Phonemic awareness includes the ability to recognize that words are made up of a discrete set of sounds and the ability to manipulate sounds. Phonemic awareness is an oral ability - the ability to hear that words begin alike, that words rhyme, and that, for example, there are three sounds in the word c-a-t. Phonemic awareness is highly correlated with success in beginning reading. Phonics instruction begins with learning to tie particular consonant letters to the sounds they typically make. Unlike phonemic awareness, which requires students to attend to both the visual form of the letter and the sound it makes. Phonics knowledge is necessary to read or decode unknown words and to spell or encode words. Thank you for your support. We have added an option on the home screen to turn off the letter sound. 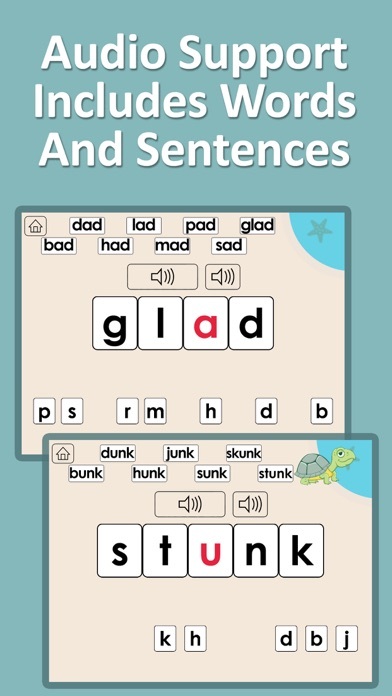 This is a great app to supplement literacy instruction! I emailed the company to ask that they give the option to turn off the audio support for letter sounds and they did it RIGHT AWAY! Now our kids can use it, relying on their 'inner voice' and sounding the letters out for themselves! Great app! This application hasn’t received enough ratings to display a summary. *Subject to Apple Volume Purchase Program terms and conditions. Note: Apple reserves the right to determine eligibility.